spread of sickness and disease whenever possible for all children in my care. activities and routines and cannot be successful in group care. you are not able to leave or stay at home from work to care for your sick child. showing signs or symptoms of illness must remain at home. arrangements to pick up your child as soon as possible. to reach them in case of emergency. • Your child will be made comfortable and offered a quiet place to rest until you arrive. illness, (s)he may not attend my child care that same day. 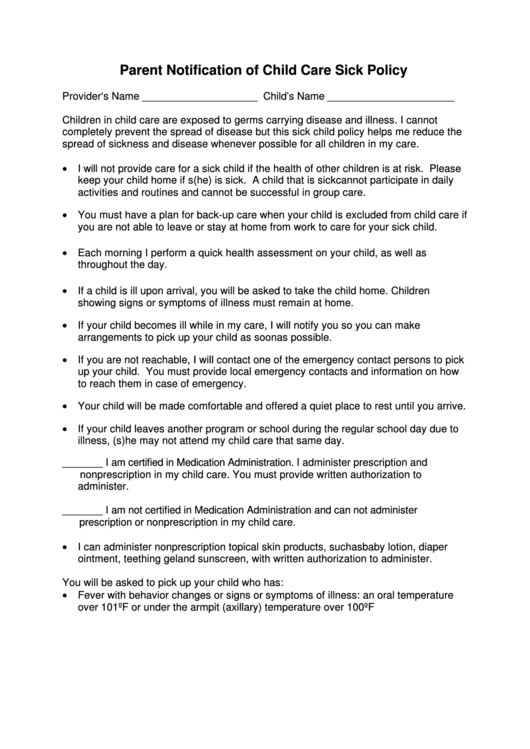 prescription or nonprescription in my child care. ointment, teething gel and sunscreen, with written authorization to administer.